In Spain, fresh fruit is commonly served for dessert both in the home and out at restaurants. At home, a basket of fresh fruit may be placed in the middle of the dinner table for family and guests peel and eat. At restaurants, you may order fruit for dessert from the menu. Usually, it's seasonal, but popular choices include green melon, watermelon, apple, and pineapple. Other fruit-based desserts include ice cream with a bit of cut-up fresh fruit on the side. Other times the fruit may be in a frozen dessert (like a sorbet or ice cream) or mixed with whipped cream (such as the popular fresas con nata, strawberries with cream). 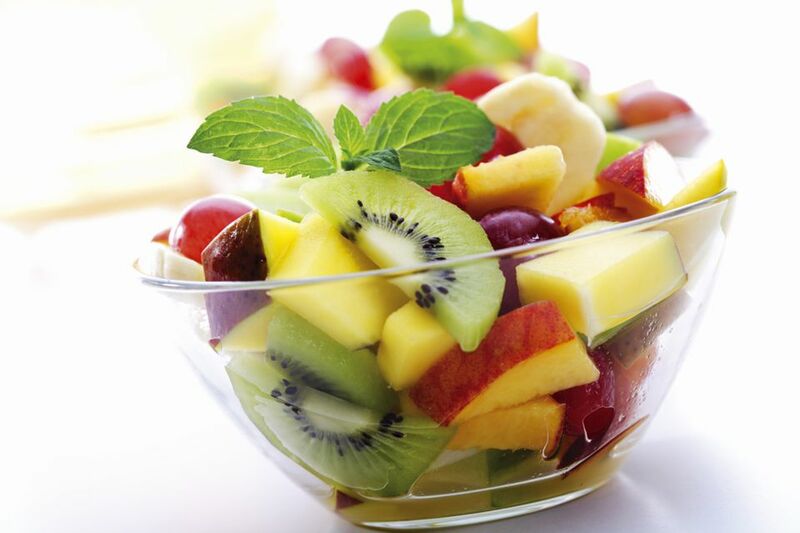 This recipe is for a simple fruit salad, which the Spanish call a macedonia de fruta tropical. Surprisingly, all of the fruit required does grow in Spain, as the tropical fruits thrive in parts of Southern Spain and the Canary Islands. This fruit salad is perfect for the whole family, but for an adults-only version, you may add a splash of rum, sparkling wine or liqueur. It makes the perfect snack, dessert, or even brunch item. Peel the papaya, pineapple, chirimoya, and mango. Be sure to cut off the “eyes” of the pineapple and seed the chirimoya. Cut the papaya, pineapple, and mango into bite-size pieces and place in a ceramic mixing bowl. Rinse the strawberries and remove the leaves (hull), then cut each into 4 pieces and place in the same bowl with other fruit. Juice the orange and lemon and pour over fruit. Drizzle honey over fruit and mix thoroughly. Place in refrigerator for at least 1 hour, or until you are ready to serve. Drunken Fruit Salad Option: If you like, splash a bit of rum, Spanish cava (sparkling wine) or Liquor 43 (a Spanish liqueur) over the salad before refrigerating. Whipped Cream Option: Whip heavy whipping cream just before serving and add a dollop of it on top of each individual serving.